I must admit, when we approached artist Jeffrey Devey to contribute a piece to PixArt I didn’t predict we’d get something as charming as this! Jeffrey’s work on Dribbble is mostly graphic design, occasionally moonlighting to do some of the best web design in Miami. His appealing text treatments and icons didn’t prepare me for the greatness that he has presented to us here. 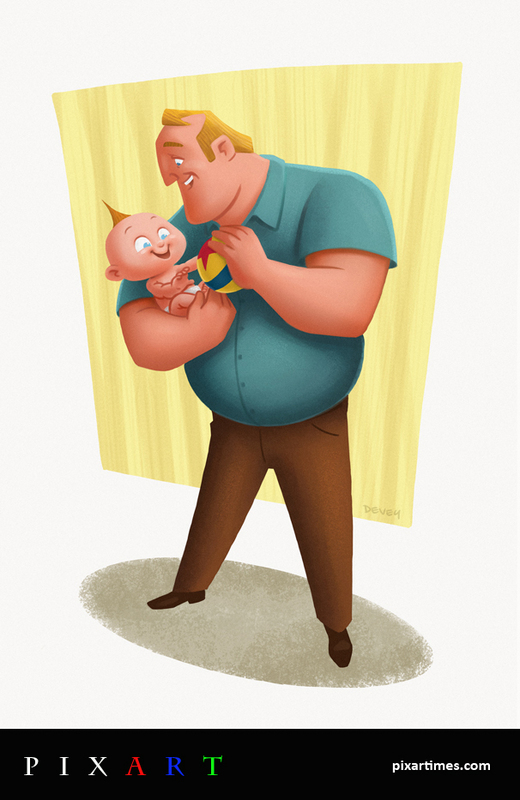 A recent father himself, Jeffrey ‘s wonderful tribute to both The Incredibles and parenthood in general is a breath of fresh air. So sincere and sweet, I’m sure this will be a favorite among our readers. Our thanks to Jeffrey for taking the time to contribute this fantastic image! It’s such a tough choice – they’re all so good. If I had to pick just one, I would say Wall•E. Again, tough call, but I’ll go with Mike Wazowski. I decided to go with a personal theme, as my wife and I welcomed our first child in September. Being a dad is such an incredible feeling! My interests are very broad, and there are a ton of talented people out there, and I’m constantly finding new people and experiences that inspire me. I only wish I had enough time to do everything! Frank and Ollie – a documentary about two chief animators who worked at Walt Disney Studios and were involved in the making of several of the classic Disney films, and were also very close friends. I’m actually not very good about promoting my work, but I’m most active on Dribbble for those who may be interested in following me there. Someday I’ll have a real website, I promise.